You can also see that we’ve replaced the Slime’s sprites… When these slimes get attacked and if they get hurt, they’ll display a health bar. 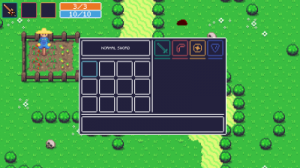 The health bar’s color is dependent on the health type of the monster. The purple slime has “water” type health, which gives it a “blue” color. Because it’s health is water based it can’t get hurt by fire attacks… which also means that it can’t catch fire and spread it all over the place. I’ve also replaced the HUD’s graphics. I think that it looks way better now than a classical black and white window. HUD now has the ability to show you if the weapon is on cooldown. You can see the cooldown in action in the video below. The “stamina” bar’s color is now also changed to more greenish color – because we all know that blue usually stands for mana. 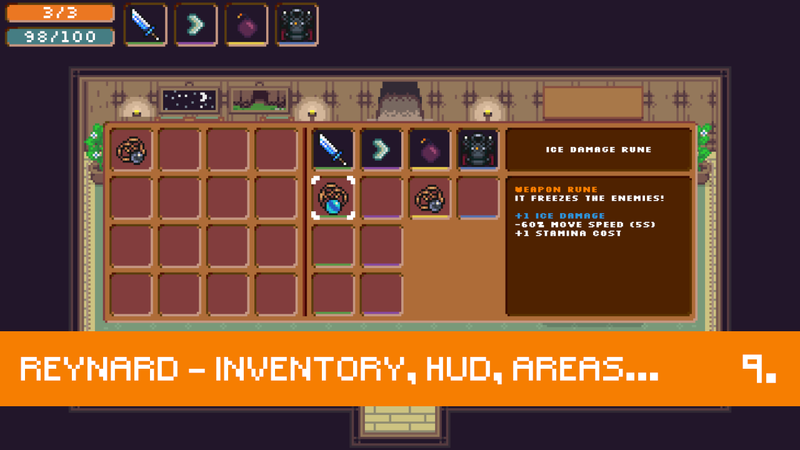 Right part is dedicated for the item’s descriptions, stats etc. I can say that inventory is already functional but I’m sure that I will update it as soon as I’ll add more different items, such as consumables etc. 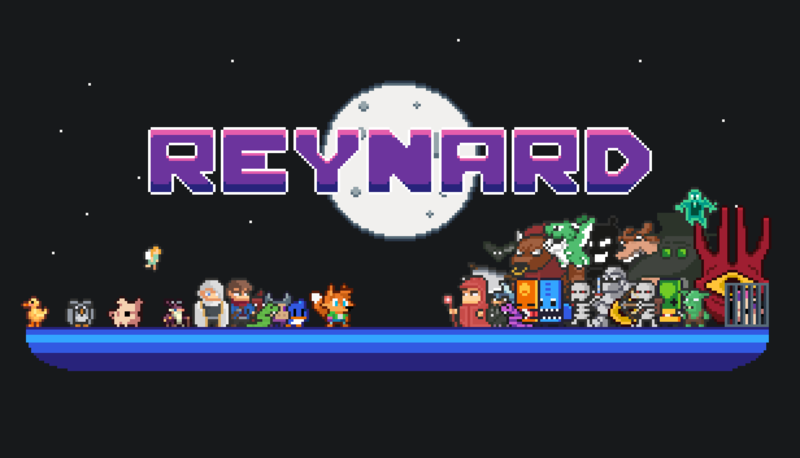 Besides the inventory I’m planning on adding “Stats” tab, where player will be able to see all of the Reynard’s “important” stats… Such as on weapon swing damage etc.. 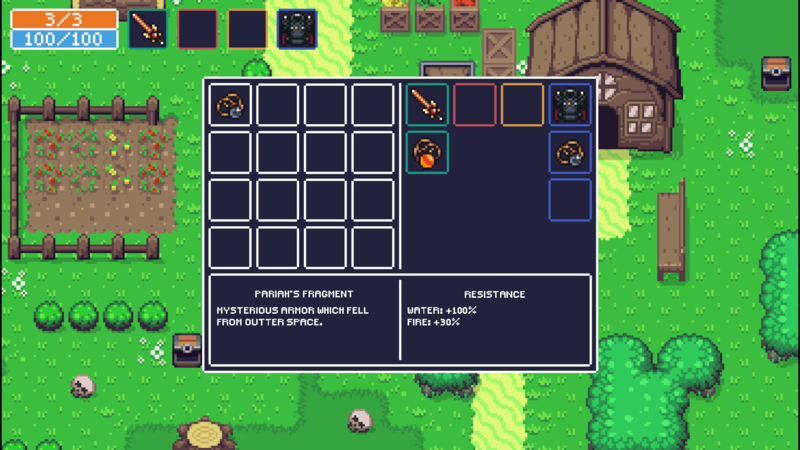 I tried to add all this info in the item’s description but I wasn’t able to fit everything in such a small window… That’s the reason why I’m thinking of implementing “Stats” tab. This time in video I’ve decided that I’ll rather talk… I don’t feel comfortable talking 😀 but it’s really easier to say things while playing the game than editing text pieces with video fragments. I think that I’ve also improved the video’s quality… The pixels look better now! 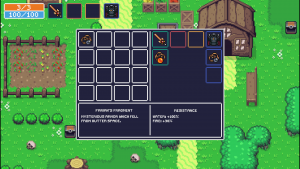 This was one of the first inventory concepts in the game. If you have any recommendations or opinions please express the in the comments down below!